I'm a realtor. I help people find the home that best fits their family's needs. I moved to Texas in 2010 and live in Little Elm with my husband, David Hillock the Mayor of Little Elm. Not only do I regularly sit on board meetings, but I can be found regularly volunteering my time with Operation Finally Home, North Texas Angels and helping my community. Being married to the Mayor gives me a competitive edge when looking into the Little Elm and surrounding real estate markets. 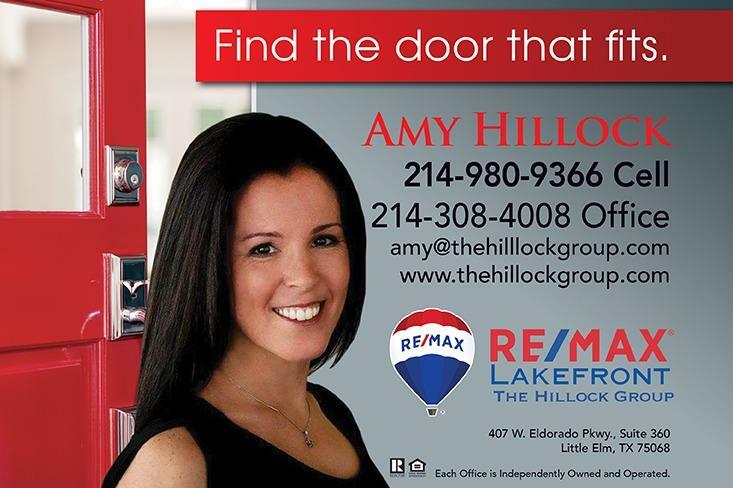 You will want to use me, The First Lady of Little Elm, as your realtor. As a real estate agent, I work with property buyers or sellers and help them navigate the complex nature of the property market. I talk with clients to find out what kind of property they want and what they are willing to sell or pay, and any specific amenities they are seeking. I work with many real estate brokers to find properties that suit my client's needs. I use a mix marketing plan of websites and flyers to describe properties, and work with photographers to take pictures of your property. I am often found working nights and weekends, showing properties to customers, setting up open houses of properties on the market, advertising homes for sale. When the sale is pending, I will work with the other party's agent to offer and counteroffer bids on the property. The selling season is coming! Are YOU ready?? The Hillock Group is here to help you with all of your real estate needs. When you sell your home with us, you are in the hands of experts who have the tools and tips to help you get the most amount for your home. If you are thinking about buying, you are in luck as well! We have extensive knowledge to help negotiate the best price for your dream home - the kind that won't break the bank. Whether you are buying or selling, The Hillock Group knows that behind every door there is a story, we will help you "Find the Door That Fits" your family's story. The selling season is almost here! Are YOU ready to sell your home? We are looking to help 25 new clients this year buy or sell real estate. We have the knowledge, experience, tools and tips to help you sell your home at the right time for the right price. We are expert negotiators and can help you buy your dream home for a payment that won't break the bank. Reach out and find out how we can help you with all of your real estate needs. Whether it is this month or next season, The Hillock Group is here to help you "Find the Door That Fits."